By Kristin Masters. Jan 2, 2013. 10:28 PM. Today is the birthday of legendary author JRR Tolkien. To celebrate the day, we sat down to talk with Pieter Collier, leading Tolkien collector and scholar. 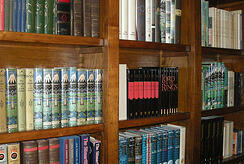 Since 2002, Collier has maintained The Tolkien Library, a website dedicated to all things JRR Tolkien. Collier has been fascinated with Tolkien since childhood, and he's built an incredibly impressive collection around the author. 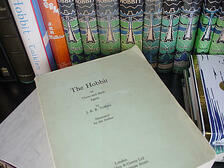 Book Tell You Why: You've been collecting Tolkien's works since you were young. Why did you connect so strongly to these stories? Pieter Collier: I don't recall exactly but I read The Hobbit when I was still a small kid and The Lord of the Rings when I was around 11 years old. Even today I can recall lying in bed with a light reading on all through the night, unable to stop reading. I remember going to the library and working myself through all the books, going to second hand book stores trying to buy any Tolkien book I could find. 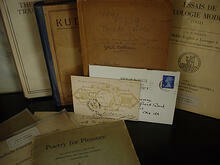 If I look back at that time, well before the internet age, collecting Tolkien books was something completely different! As far as I can see it now it was my search for more Tolkien that did make me start to collect Tolkien books. At first I just wanted to have his books close by so I could read them when I wanted. Then I found nice illustrated editions, books with Tolkien-inspired art and soon wanted to learn more about the man behind the books--and ended up with several books about Tolkien. By the time I was 14 I had a nice Tolkien book collection and went to see several Tolkien exhibitions. The year was 1992 and we celebrated the Tolkien centenary, so I went to Tolkien exhibitions in Belgium, The Netherlands, and England, where I learned that there was much more to discover and read by and about Tolkien.From that day my collecting passion only grew. It was (and still is) a very nice adventure. While I started out being passionate about Middle-earth I soon found many new passions: books, collecting, and the author J.R.R. Tolkien. Because I started very early on, I managed to obtain some very nice items. Books Tell You Why: Why do you think Tolkien's stories resonate with such a broad audience? Pieter Collier: It is a question I have asked many Tolkien scholars and my wife keeps asking me now and then. It is not so easy to explain. Some people just hate Tolkien's stories and others simply love them. It seems that there is no middle of the road when it comes to Tolkien. However it amazes me, after selling Tolkien books to fans all over the globe, how widespread the love for Tolkien's tales really is. I believe it is because Tolkien was an expert in old tales and mythologies and managed to create a world that brings the perfect mixture of the old stories. Somehow it must be in our genes to love such tales and resonate with a broad audience.  It is present from the beginning to the end of The Lord of the Rings and is an important lesson. But what I always remember when thinking about The Hobbit and The Lord of the Rings  in that light these are two very similar tales  it is possible for even the smallest person to overcome this, and step by step grow into a big and great man, without falling into the traps that power and corruption bring. Both books are simple transitional tales telling us how even the smallest of people can get done great deeds and manage to accomplish amazing things. I believe this message inspires many across the globe! Maybe today even more then ever before. Books Tell You Why: What's your favorite item in your Tolkien collection? What items would you like to add? Do you collect anything else? Pieter Collier: Almost every book in my collection does have a tale. Come to my home and Ill be able to spend some hours with you showing all the books and telling their own story. My most precious book must be the set I first read, a 1st printing of In de Ban van de Ring (the Dutch translation of The Lord of the Rings). Next to that I do treasure a super deluxe The Silmarillion signed by Christopher Tolkien, which is one of the most beautiful copies ever produced and extremely difficult to find. The core of my library is a large amount of books from Tolkiens personal library and a massive collection of proof copies of all Tolkien's books. But at the moment the absolute top of my collection will probably be an triple signed first deluxe edition of The Lord of the Rings, that came out of the collection of Pauline Baynes. My collection is rather fluid, in the sense that I have learned that I can sell items in order to be able to acquire new books. Collecting Tolkien books is a rather expensive hobby and so it is always nice to be able to sell books and be able to go hunt for new items. I have to admit however that I'm only buying top pieces these days and only go for quality items. Besides Tolkien I do have my family  my wife and 4 kids  which is my greatest passion. Next to that I do work a full-time job as head of department Web Design at Android, where I spend most of my time. Tolkien comes in third place and most of the time is reserved for late in the evening or night. Because there are only 24 hours in a day and 7 days in a week there is no room for other passions, hobbies and collections! The only thing I like next to good food and good wine, are documentaries, but its hard to find very good ones. 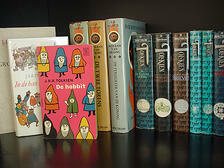 Books Tell You Why: What advice would you offer novice collectors who wish to focus on Tolkien? Go for quality and never for quantity. Enjoy the tales behind the books more then the books themselves. It is nice being able to buy the more expensive books, but the quest in finding them will always give you more pleasure. Building a collection following these rules will take much time, but it will be an adventure that will bring the most enjoyment. Share your passion with other collectors and learn from others while talking about your passion. Focus on one topic, it is impossible to own everything. Books Tell You Why: Tolkien's friendship with CS Lewis is well documented, and obviously the two writers influenced one another. Who else influenced Tolkien? Pieter Collier: This question is material that has been filling numerous books over the last few centuries. Tolkien was famous to be inspired by names, languages.... He was a word-collector, a dialect lover, and I think most of his tales all started out with words and the stories just followed. There are several authors that must have had a great influence on Tolkien, yet mythologies and old folk tales must have had a bigger impact. I believe one of the better books talking about many of Tolkien's influential sources is There and Back Again: J.R.R. Tolkien and the Origins of The Hobbit by Mark Atherton. Books Tell You Why: How important was historical context to Tolkien's works? Could he have written these stories, say, 20 years earlier--or later--than he did? Pieter Collier: That is a rather tricky question. Tolkien's tales were constantly being rewritten, and up to the end of his life he was still making changes to many of his stories. The published version however is a different thing. But even there we all know that the 1st edition of The Hobbit, brings us a completely different version then later printings (since Tolkien had some parts altered to match the new book he had written, The Lord of the Rings). Still this is probably not what you wanted me to answer and I have to admit Tolkien was an author who lived through the Great War and had his son participating in the second World War. Tolkien clearly was against the Industrial Revolution and still remembered rural and idyllic England. It is inside his books and maybe this would have been less strongly present if he had time to rewrite some parts later on in his live. Books Tell You Why: The Fall of Arthur will be published this year for the first time, which is certainly exciting. Why do you think Tolkien didn't publish this work himself in his lifetime? Could there be other unpublished work awaiting discovery? Pieter Collier: The Fall of Arthur is a long (unfinished at 954 lines) alliterative poem that Tolkien composed in the thirties. Various drafts and outlines are also extant. As late as 1955 Tolkien wrote that he still hoped to one day complete the poem, but I know of no evidence that he ever returned to it after abandoning it in the mid-thirties. I believe the reason why it was not published or available to be studied by Tolkien scholars will be known when it will be released this May. But I guess Tolkien's version of The Fall of Arthur will be far different from the version we know so far, and maybe there lies the key to why it was sort of hidden for us for so long. We know of some other unpublished poems and essays that are said to exist, but I don't know if they will ever be published. But then again this is the third time I must have written this, and I never expected to be able to read The Fall of Arthur during my life-time. In that respect I'm much more excited to read Tolkien's new book then to for example go and see another movie adaptation of his books. Books Tell You Why: The movie adaptations of Tolkien's works have been an incredible success. What's your take on the films? Pieter Collier: Yes of course I have seen the movies. I went to see them in the cinema and have seen them a couple of times later on. But in general I am not a movie lover and prefer the books over the movies. While I believe Peter Jackson did create a piece of movie history and probably the best possible rendition of the books, to me it was a scary and difficult experience. Now I dont mind too much any more, but I recall being very angry and disappointed after seeing the third movie. In the end the movies were produced for a mass audience and not for Tolkien nuts like myself, but I found it very hard to see some scenes and changes. I truly thought leaving out the scouring of the Shire, to me the essence of the books, was a painful mistake. What disturbed me the most was the misuse of language. In the books you only need one sentence to find out the race or person who is speaking. OK, it is all English, but the subtle differences are extremely fine. In the movie any character could speak lines of other persons or even races, so destroying the strongest element in the books. But I have to be honest, the movies were brilliant and when I see them today I can truly enjoy what Peter Jackson gave us. As for the recent The Hobbit movie, I went to see it just a few days ago, and was not too impressed but also not too disappointed. The visuals are nice, the cinematographic effects once again all over the place, but the end result has nothing much to do with the books. Tolkien is clearly the better story teller! Books Tell You Why: Today, January 3, would be Tolkien's 121st birthday. How do you honor him today? Pieter Collier: To celebrate Tolkien's birthday, each year I invite some of my Tolkien friends (or we meet up at a pub or restaurant) to raise a glass and toast the birthday of Tolkien. The toast is "The Professor." For those unfamiliar with British toast-drinking ceremonies, to make the Birthday Toast, you stand, raise a glass of your choice of drink (not necessarily alcoholic), and say the words "The Professor" before taking a sip (or swig, if that's more appropriate for your drink). Sit and enjoy the rest of your drink. It is a nice occasion to get together and catch up. In the past I used to go to birthday toast meetings of the Flemish or Dutch Tolkien Society, but these days I prefer to meet up with good friends. 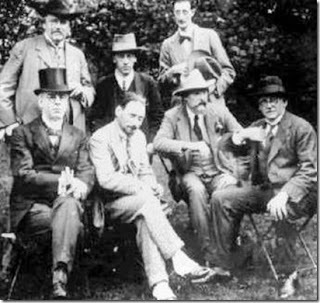 Most of them have kids now and it is fun to combine family fun, good fun and Tolkien. I believe Tolkien himself would have loved it that way himself.